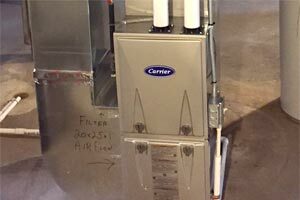 Install a Carrier 16-SEER Air Conditioner and a 96% AFUE Furnace. Up to $1,575 more savings on rebates from the manufacturer and energy companies. Minnesota’s harsh winters make high-quality heating equipment a must for homeowners and commercial property owners alike. For over 25 years, Minnesotans have turned to Residential Heating and Air Conditioning, the parent company of Twin Cities Duct Cleaning, for their heating needs. As a leader in furnace sales and installation and a Carrier Factory Authorized Dealer, our legendary reputation has made us a top choice for residential and commercial heating and air conditioning throughout the Twin Cities metro area. Combining top-quality equipment made by Carrier, Lennox, Goodman and Payne with customer service that has won us the praises of more than 35,000 customers, we offer fast, expert installation of a full range of heating solutions. Gas Furnaces – We feature the full range of energy-efficient forced-air gas furnaces from Carrier, Lennox, Payne and Goodman, and are authorized dealers for these brands. From low-cost economical systems to high-efficiency models, there’s an ideal gas furnace to meet your needs and budget. Heat Pumps – Carrier, Lennox, Goodman and Payne heat pumps provide both fall heating and summer air conditioning. The combination means great energy savings and improved comfort for your home. Air Conditioning Systems – A new or replacement central air conditioning system from Carrier, Lennox, Goodman and Payne is the key to a comfortable home in Minnesota’s hot, humid summer weather. We also sell and service mini-split ductless air conditioners. 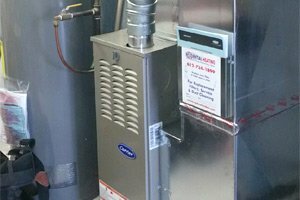 Gravity Furnace Replacement – If you have an older home with one of these outdated, inefficient heaters, we specialize in replacing it with modern, efficient natural gas furnaces. Because of the asbestos in the insulation materials used, removing these old heaters requires highly specialized skills and training. Call us for a free consultation and learn how we handle this complex job at prices you can afford. Commercial HVAC Sales – As the leading heating contractor in Minneapolis St. Paul, we also specialize in rooftop HVAC installation, repair and maintenance for small and medium commercial buildings. Whether you’re replacing an older inefficient rooftop unit or need a complete new heating and AC system from Carrier for your property, contact us for quality sales, service, and repair. Call our Minnesota locally owned and operated heating company for a free, no-obligation consultation at your home or business, regardless of your location in the Twin Cities, from Edina, Plymouth, Wayzata and Minnetonka to Inver Grove Heights, Woodbury, Lake Elmo and White Bear Lake, and from Savage, Apple Valley, Eagan and Bloomington to Fridley, Columbia Heights, Champlin and Blaine. We’ll be happy to help you create a customized, affordable heating and cooling solution. You won’t get a high-pressure sales pitch; we’ll give you the information you need to make a great choice. From a low-price unit for a residential rental property to a complete rooftop HVAC system for your commercial property, we can supply any HVAC equipment that meets your requirements. During our in-home or on-site consultation, we will present you different options along with pricing information. 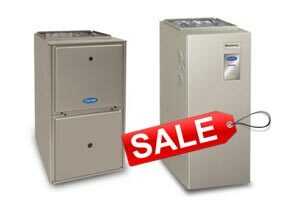 We will offer you an accurate quote on how much your new furnace installation costs. We will leave the decision to you. As one of the largest furnace dealers in Minneapolis St. Paul, we receive volume discounts from our equipment suppliers. We pass our savings on to our valued customers by offering some of the lowest prices on Carrier, Lennox, Goodman and Payne products. We will also help you qualify for cash rebates offered by manufacturers and energy companies for more savings. Since 1991, our residential and commercial heating company has been supplying and installing top-quality HVAC products at affordable prices for Minneapolis St. Paul homes and businesses. Our dedication to quality, value, and customer service is the hallmark of our reputation and the reason for our success.